Shown below is a very good drawing showing how to wire in BEC Circuits in general. 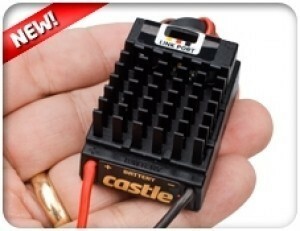 Comes from Castle Creations and is provided with thier BEC Pro instruction set. Castle Creations BEC Wiring Diagram Sample. Dimension Engineering's Very High Voltage BEC is the world's first BEC compatible with input voltages as high as 60V/14s lithium. Perfect for pilots who will be flying with very high voltage battery packs. It can power your receiver and servos with up to 2.5A. VHVBEC is especially well suited for high voltage helicopters running 4 high speed/torque digital servos. Installing and using VHVBEC is much more convenient than monitoring and recharging a receiver pack. VHVBEC's output is selectable between 5V/6V using a small slide switch. The 6V setting gives more speed and torque to the servos and is especially useful for helicopter flyers. A red LED indicates when 6V is selected. As with all of Dimension Engineering's BEC products, VHVBEC has been carefully designed and tested to ensure it does not create radio interference. You can use it without fear of glitching. When used with non-optoisolated speed controls, VHVBEC has a handy throttle pass-through feature that allows you to install it without cutting up your ESC's wires. When used with optoisolated speed controls, VHVBEC installs easily by plugging it into the battery port of your receiver. For best results, ensure that your VHVBEC is installed at least 2 inches away from your receiver and antenna. SportBEC is the higher capacity version of our best-selling ParkBEC product. 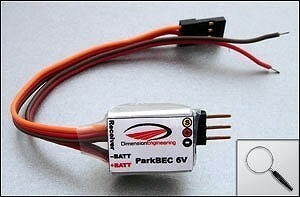 SportBEC powers your receiver and servos much more efficiently than a standard BEC. As many as 8 servos can be powered without worrying about an overheating BEC. SportBEC works great up to very high voltages, and is especially suited for "sport" aircraft and glow conversions. SportBEC is usually a necessity at 4s and above when running high torque or digital servos. Additional notes If you are using small servos make sure they can run at 6v. Some sub-micros, notably the Hitec HS-50 and Futaba S3154, can be damaged by a 6v supply.